Regular visitors to this blog will know we have a love of markets; markets of the foodie variety. We visit our local ones here in Fethiye three times a week; Tuesdays, Fridays and Sundays are spoken for in our house. And, if we miss one of those, we’ve even been known to head to the Saturday Patlangıç market or even take a longer stroll out to Çiftlik Thursday market. 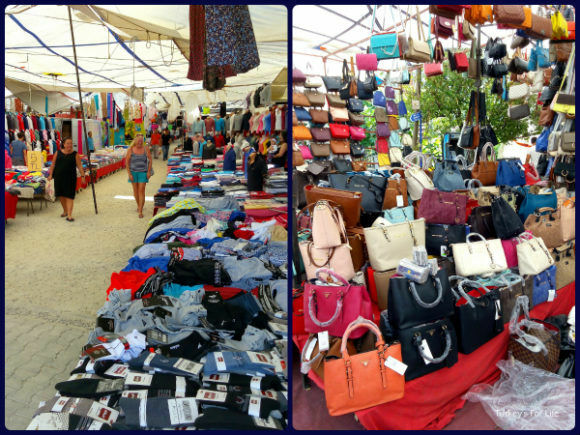 The Çalış Sunday market – the subject of this article – is one of life’s happy shopping experiences. Shopping at our local markets is never a chore. 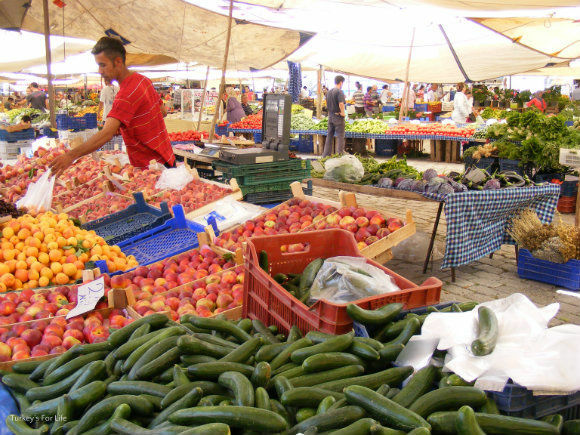 Every Tuesday, we stroll into town and go to the massive Fethiye market. This is perhaps the town’s best known market; day trippers flocking here in the summer months. For us, it’s a food shopping zone. Fridays are a bit more of a relaxed affair – this time, it’s the köy pazarı (the village market). Same site as the Tuesday market but foodstuffs only and it’s locally grown and locally produced. 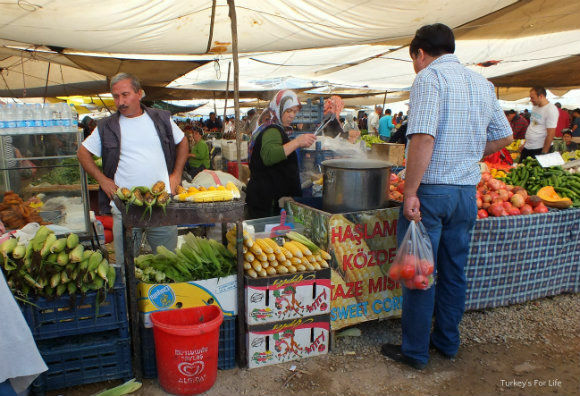 Because of the fame of the Tuesday market, Çalış Sunday market can sometimes get a bit neglected and that’s a shame. It shouldn’t. 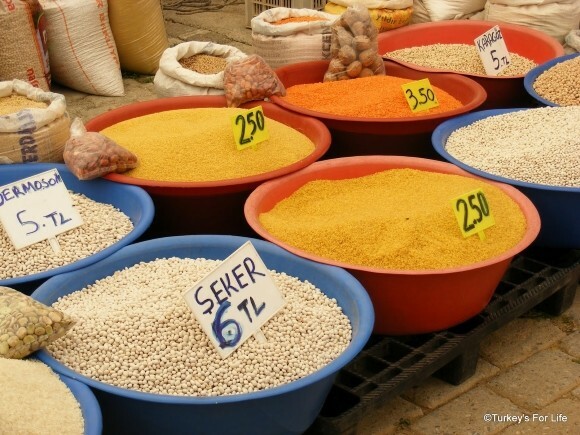 If you’re holidaying in the Çalış area, you can get all the goodies you could get from other markets. It’s just that the Sunday market in Çalış is more compact, less crowded and more chilled. A bonus, surely? Çalış market has a more laid back atmosphere than its Tuesday counterpart over in the centre of town. Where the food is concerned, maybe it’s that Sunday feeling, but people tend to browse more slowly. For most working Turkish people, Sunday is a day off. Time to relax. So it’s not about just getting a weekly shop done as quickly as possible and then darting off. There’s a bit more standing around and chatting and greeting. As you can see in the photo above, it’s not that people don’t come to shop here. They do. The fruit and vegetable stalls at the Sunday market do a brisk trade. But shoppers seem to be in a better mood. A bit more time on their hands than they might have on other days of the week. As with other markets around the area, the food doesn’t stop at fresh fruits, vegetables and salad stuffs. You can get all your dried fruts and nuts – we love to buy these to make up lots of our own muesli – and you can get local honey, too. We try to make a point of buying the local honey over supermarket varieties for a couple of reasons. One is because it supports the local producers in a product that Fethiye is famous for and the other reason is because a beekeeping friend has suggested local varieties can help with a pollen allergy that I seem to have developed of late. And then there are the dairy stands. This is where you come to buy your village butter, cheeses, olives and delicious süzme yoghurt. In summer, you need to hurry on home with your loose butter lest it turn to liquid before it reaches its new chilled home in your fridge! These are the stalls where you can also pick up tarhana or a bit of salça (tomato or red pepper puree) and all of these are often cheaper than the supermarkets. Another incentive to support local Turkish markets. You’ll see a lot of the same types of stalls on the Sunday market in Çalış as you would elsewhere in the area. You may even recognise a few of the faces as many traders do the rounds – different day, different market. If you’re anything like us, for some goods, we have the same stalls every time. It all makes for pleasant chit chat as you choose your produce. But there isn’t a bewildering amount of stalls. It’s more than enough to get what you need – although, having said that, UK shoppers who are used to the paltry markets back home will still find Çalış Sunday market to be large and bountiful. There’s more of a haphazard feel to the Çalış Sunday market. Don’t get us wrong; the stalls are laid out in linear fashion but there’s no permanent indoor section with the regimented layout. The Sunday market is all about portable tables and tablecloths; all of them absolutely rammed with seasonal produce. And, as with any market that sits in a tourist destination, Çalış market has all the usual jewellery, sunglasses, hats, bags and clothes stalls – but with a fraction of the visitor numbers. The coaches from resorts elsewhere along the coast are not interested in Çalış Pazar. Like we said, it’s chilled. 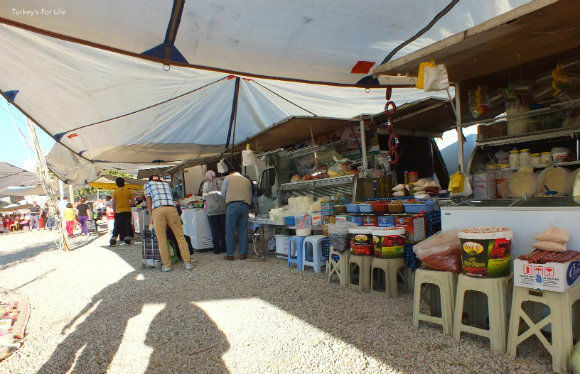 There are far more stalls in this section of Çalış Market during the summer months. Winter is predominantly about food. If you’re looking for famous Turkish souvenirs like purses, handbags, the usual sporting regalia, footwear and sunglasses; well you’re not going to go far wrong here. And, for the most part, this area is usally very quiet. More room for browsing…and possibly more room for a bit of haggling, too. All that shopping can make you build up a bit of a thirst. You might also be hungry, too. Eating at the Çalış Sunday market is one of our (and many other people’s) favourite parts about shopping here. If you just want a healthy snack that you can eat while you’re on the go, how about a barbecued or boiled corn on the cob? Hungry and thirsty shoppers are still able to take things more slowly though and sit at one of the food stands. Enjoy a döner kebab, some spicy kokoreç, gözleme or a hot village bread (bazlama) served with melted butter and cheese inside. Hot and cold drinks, including traditional ayran and freshly squeezed fruit juices are also available. And, creatures of habit and all that, we have our favourite stalls. 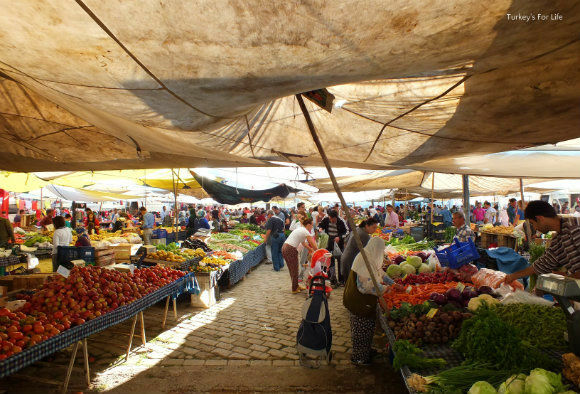 Whether it’s the Çalış Sunday market or the Tuesday market, we park ourselves at the same place each week. Or these days, there are always the bars and restaurants nearby. Çalış Sunday market used to be a bit out in the sticks. These days, it’s surrounded by villas, apartments, supermarkets and those all important watering holes and eateries to quench thirsts and feed hungry bellies. Çalış market place is on Yerguzlar Caddesi in Günlükbaşı, about 2km from the beach. View the location on Google Maps. It takes place every Sunday, early morning until sunset. Every Sunday, the Fethiye-Çalış dolmuş makes a detour so that it can drop off and pick up at the Çalış Sunday market. Whether you are arriving from the Fethiye or Çalış side, just tell the driver you’re going to the market and they’ll drop you at the entrance. Shopping or browsing around the markets is an experience. If this is not your thing, however, here some more Fethiye activities you can do while you’re in the area. Seasonal Food in Turkey – Huge Green Cabbage! I had no idea about the Çalış market and actually it sounds like my kind of thing. I love the huge Tuesday one but often found it overwhelming on a hot day. And I hadn’t realised that the Sunday market was all local, which mean a much better chance of getting organic food (not marked as such though), which is important to me. I knew that the food at the Üzümlü market was all organic. Not that Organic in it’s modern sense means anything to them, it’s just the way they have always grown things – the natural way. Yay! I adore markets like this!!! GREAT pictures- made me want to jump through the screen of my computer and browse around the stalls. these local markets never cease to please and make shopping a pleasure. After 15 years here, and with all the adventuring we do, we still regard our weekly trip to Ortaca market as a highlight. 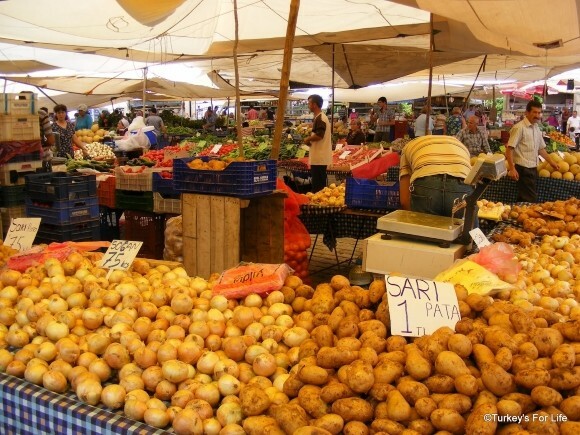 I love these markets…..when I’m in Izmir or Istanbul or Bergama I never miss a day without going to some market. I get to know which day it is at and where? It is so different then what I’m use to going to some big city supermarket….so colourful and interesting at those Turkish markets…. great post and pics. @ Alan: Completely agree with you. we take such pleasure in shopping at the markets in Fethiye. Will never take them for granted. Thanks for your comment. Yeah, we like that Çalış market s more ow key to Fethiye market – although we do like both of them. 🙂 We’ve bought some seasonal barbunya today to make barbunya pilaki. Still not been to Zarya yet, heard lots of good things, though.